The Aston ZAA216 87 in. Corner Steam Shower Whirlpool Tub with 18 Jets is designed to fit snuggly into your bathroom to help save important space. This model has all of the features needed to transform your bathroom into an oasis. Enjoy the many body jets, overhead rainfall experience or handheld shower to indulge into a unique showering experience each time. The whirlpool tub provides an alternative to a luxurious shower by allowing you to sit and enjoy your massage tub one jet at a time. You will have everything you need in this model to add an elegant and luxurious experience available in your own home. The Palram San Remo patio enclosure provides the perfect setting for your lounging area, creating both a sense of tranquility & privacy. It features the Click N' Lock roof connector system, for safe and simple assembly, locking the glazing between the structure rods and preventing water from penetrating the glazing. Only high quality polycarbonate and aluminum are used to ensure years of enjoyment for you and your family. The 8mm Twin-Wall polycarbonate white opal roof is 100% UV protected and defuses the sunlight, creating a pleasant atmosphere, protecting your precious furniture from the sun's harmful rays. The walls are high impact transparent acrylic walls. It withstands extreme weather conditions such as hail & snow. The heavy duty, high quality, yet lightweight frame is made of sturdy extruded powder coated aluminum. It is corrosion resistant & durable. 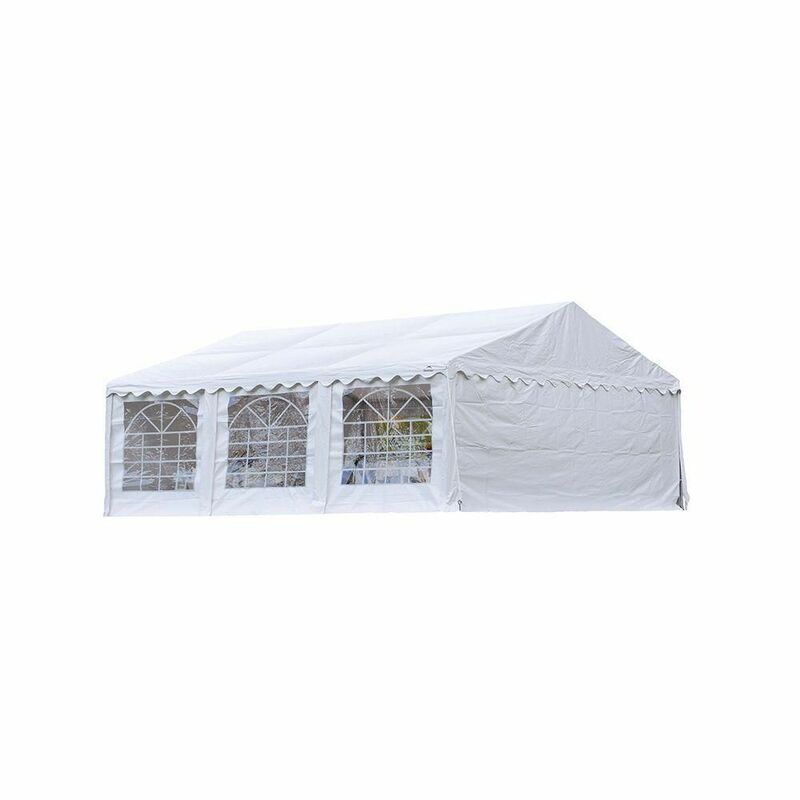 20 ft. x 20 ft. Party Tent & Enclosure Kit in White is rated 1.0 out of 5 by 1. Rated 1 out of 5 by frank from dont waste your money I put them up last night and from litle wind last night and rain they bent in half... So im at home depot now and thy dont even carry accesorys to replace the bent parts...Dont wast your money!! !